Starting Thursday, you can try your hand at taking out Gary Busey in Hitman. Back in March, there was a Hitman promotion that gave Twitter users the choice of a celebrity target who would appear in the game at a later date. Voters could choose between two actors named Gary: Gary Cole and Gary Busey. Gary Busey won that vote, and this week, you'll finally get your chance to gun him down. 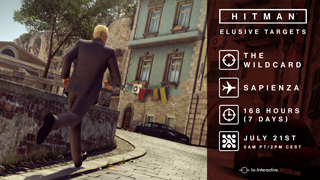 Starting Thursday morning at 8 AM ET, Busey (also known as "The Wildcard") will be found in Sapienza for seven days. If you can't find him and take him out before the week is up, you'll miss out forever, as he'll be gone. Like all the Elusive Targets in the game, you'll only have one chance to take him down. If you die along the way, you'll fail the contract. There are no retries. If you've got it in for Gary Busey, this is your best chance to take him out. I have to admit that I'd miss his Amazon commercials, though.